So just who is Nuggets 41st pick and former Kentucky Wildcat, Jarred Vanderbilt? Jarred Vanderbilt is the most unknown quantity on the Nuggets roster. The once a five-star high school recruit brought his talents to the University of Kentucky last year, but saw his stock plummet throughout his freshman year leading up to the draft. Even with his stock falling, that did not make the Denver Nuggets front office any less excited when they had the chance to draft him in the early portion of the second round of the 2018 NBA Draft. In their minds, Denver was able to draft a lottery-caliber talent early in the second round with the 41st pick who fits their long-term needs and fits well on the roster as currently constructed. So just who is Jarred Vanderbilt? Well, let’s dive in. Vanderbilt was easily one of the most productive rebounders in college basketball last season even without tons of playing time. Statistically speaking, very few rebounders have ever gobbled up boards at the rate that he did last year. In just 17 minutes per game last year with Kentucky, Vanderbilt managed to still average 7.9 boards with 3.3 of those rebounds coming on the offensive end of the floor. That equates to a flat-out absurd 26.5 rebounds over 100 possessions thanks to an overall rebounding percentage of 25.7. Also, Vanderbilt’s rebounding percentage of 25.7 would have led all of college basketball if he qualified. Think about that; a rebounding percentage of 25.7 means that when Vanderbilt is on the floor, he is personally grabbing over 25 percent of all available rebounds on both ends of the floor. Vanderbilt’s freakish rebounding ability eventually led to John Calipari to compare him to one of the greatest rebounders of all time, Dennis Rodman. To go a step further, if you add up all of the minutes and rebounds that Vanderbilt pulled down over his career, the number is even more impressive. Between the FIBA U-16, Adidas Nations, Nike Global Challenge, Nike Hoop Summit, McDonalds All-American game, Jordan Classic, and Nike THE TRIP, Vanderbilt was able to accumulate 268 rebounds in 686 minutes. That means from high school events until now, Vanderbilt has averaged 15.6 rebounds per 40 minutes over his career. So what makes Vanderbilt such an impactful rebounder? Well, his effort is the main reason why. Look at the video above as Vanderbilt holds his space down low as the shot is in the air. He is reading the ball during its flight to the rim and has concluded that his spot on the floor is the most likely area to grab the impending rebound. Vanderbilt uses his strength to hold his ground between two opponents and uses his athletic ability to high point the ball after it bounces off of the rim. This offensive board is all effort from Vanderbilt. The other reason why Vanderbilt inhales so many rebounds is his tenacity. Even when he isn’t in position to grab the rebound, he fights and scraps to get to a spot to grab the loose ball like he does below. This is nothing but passion, aggression, and strength from Vanderbilt. He was never in a strong position to grab the rebound, but he still fights through one box out to get right below the rim before eventually tipping the ball up and in for a potential and-one opportunity. This is why Tim Connelly has called Vanderbilt, “one of the best rebounders I have seen.” He fights for every rebound all of the time and because of his intensity on the boards, he adds extra possessions for his team consistently. Having a rebounder that will do everything in his power to get to the ball is an extremely important type of player for the Nuggets. 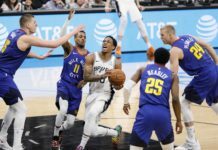 Being able to secure defensive rebounds as well as accumulate offensive rebounds maximizes the amount of possessions for the Nuggets’ hyper-potent offense. Vanderbilt fits that mold perfectly on both ends of the floor for Denver. By far the most underrated part of Vanderbilt’s game is his above-average handles with the ball in his hands. The video above shows how talented and comfortable Vanderbilt is with a live dribble. He collects the defensive rebound and quickly realizes that he has a three-on-one fast break opportunity. He pushes the ball up the floor himself, looks off the only defender, and makes a no-look pass on the move to get his teammate an easy pull-up jumper just outside the paint while making it look effortless. For someone who is six-foot-eight, that should not looks so easy. The reason is that Vanderbilt is such a comfortable playmaker off the dribble is because of his past. Before and throughout high school, Vanderbilt acted as the point guard on his teams. The last part of that quote is the most important. Even after his growth spurt, he continued developing his ability with the ball in his hands. It really was not until his time at Kentucky that he moved away from a playmaking-type role. Even more impressive is that Vanderbilt is instinctual as a ball handler. Being comfortable with the ball is one thing, but plays like the one below show how talented Vanderbilt truly is with the ball in his hands. The level of difficulty of the behind-the-back dribble that Vanderbilt unleashes above is almost unquantifiable. After deflecting the ball off of the inbounds pass, Vanderbilt grabs the loose ball with his off hand before going behind the back and making the opposing defender look foolish. Big men rarely have the coordination to make a play like that. Vanderbilt believes in his handle and uses it to set up defenders. Look below at how Vanderbilt widens his dribble to get the defender to bite before going behind the back once again and sending the opposing defender flying to the opposite sideline. When Vanderbilt puts his comfort level as a ball handler, his skills as a passer, and his instincts together, the result is stunning. Look below at how Vanderbilt grabs the rebound and immediately begins to put the ball up the floor knowing his team has numbers. A defender steps up to slow Vanderbilt, but he crosses over to his off-hand to turn the defender to his left. From that moment, Vanderbilt knows that he has set up the defense exactly how he wanted to and prepares to punish them. Once Vanderbilt crosses over from left to right is when the defenders hips turn. That is when Vanderbilt strikes by throwing a one-handed wrap-around pass back the opposite way to a cutting teammate while running full speed. The level of difficulty of that pass is insane, but somehow Vanderbilt makes it look easy. Those skills could eventually help mitigate Vanderbilt’s issues as a scorer. If he can begin to operate as the ball handler in pick and rolls, like he does below, he could begin to build himself into a helpful offensive player. Look at the feel that Vanderbilt has above. Not only is he running a pick and roll, but he is constantly making reads, using diverse dribble moves to get by his opponent, and constantly switching speeds to keep the defense flat-footed. Vanderbilt’s ability to create with the ball in his hands is still largely untapped, and on a Nuggets team that plays with such a pass-happy style, there could be a large future role for Vanderbilt in Denver sooner rather than later. While Vanderbilt’s playmaking is what can make him into a useful offensive threat, his real value lies in his ability to be a versatile defender. Vanderbilt defended all five positions from time to time at Kentucky and the Wildcats even began switching more ball screens this past season when Vanderbilt was on the floor. He was able to stay in front of smaller guards and defend on the perimeter very well considering that he is still just 19 years old. Look at how active Vanderbilt’s feet are in the clip above. One of the most important aspects of a big defending in space on the perimeter is that he cannot get flat footed. Above, Vanderbilt keeps his feet moving, turns his hips fluidly, and contested well using his length and burst. If Vanderbilt is consistently able to switch onto smaller players and defend like he does above, he will likely have a very long career in the NBA. Even in the clip below, where Vanderbilt almost gets beaten over the top, you can see what makes him an enticing prospect on defense. The Wildcats immediately switch the dribble handoff at the top of the key and Vanderbilt ends up on a smaller and quicker guard, who promptly asks for an additional screen. Instead of using the screen, the opposing guard has plans to reject the screen and use his quickness to blow by Vanderbilt, but suddenly realizes that he isn’t able to. Vanderbilt leans away from the screen as it is coming and stymies the oppositions attempt to get by him. In most of the film of Vanderbilt, he very rarely gets beaten when guards reject screens. That speaks directly to the quickness of his feet laterally and is a great sign when projecting his defense to the NBA level. Vanderbilt does not only rely on quickness and instincts as a defender either. Positionally, he is better than given credit. In the clip above, Vanderbilt is defending a smaller guard, but gets switched onto the big after the screen. Instead of giving up on the opposing guard, Vanderbilt stays in front of the big he is defending and plants himself firmly between the guard and the big so that there is no passing lanes for the guard to get rid of the ball. This means one thing: the guard now has to take the ball to the rim himself or reset the offense. Vanderbilt sits on the guard making a move to the rim and blocks his shot while sealing off the big from being able to receive a pass. Vanderbilt is dedicated defensively and can be a terror on that end of the floor. 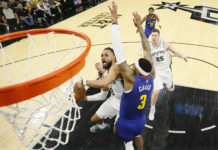 He isn’t an elite vertical athlete, but his quick-twitch athleticism shines when he is rotated onto a smaller player or has to defend in space. For a Nuggets team largely devoid of defensive stalwarts, Vanderbilt has the frame and mental ability to be an impactful defender his entire career. That is big for both the Nuggets and Vanderbilt. Even though Vanderbilt has the ability to play with the ball in his hands, that was never going to be the role that he played when he arrived in Kentucky to play for the Wildcats. While playing for Kentucky took Vanderbilt out of his comfort zone, he also found new ways to contribute to winning basketball. While learning to play as a more traditional big man, Vanderbilt discovered the ability to create looks for himself by cutting back door and getting off-ball buckets — something that should shine brightly with the Nuggets. The play above is used by the Nuggets frequently. Imagine the play if it was instead ran with the Nuggets personnel: Jamal Murray gets a pick from Nikola Jokic at the top of the key. Murray gets the ball to Jokic on the short roll, he forces the help defense to step up, and Vanderbilt does what Kenneth Faried used to do by just following his defender as he gets sucked into providing help defense and gets an easy and wide open dunk because of it. Being able to see the soft spots on the floor will allow for lots of easy buckets for Vanderbilt. That isn’t to say that Vanderbilt can’t operate in other sets. Look below as he occupies two defenders after the dribble handoff to create space for his point guard before eventually getting the alley-oop slam. The ability that Vanderbilt shows above is great. 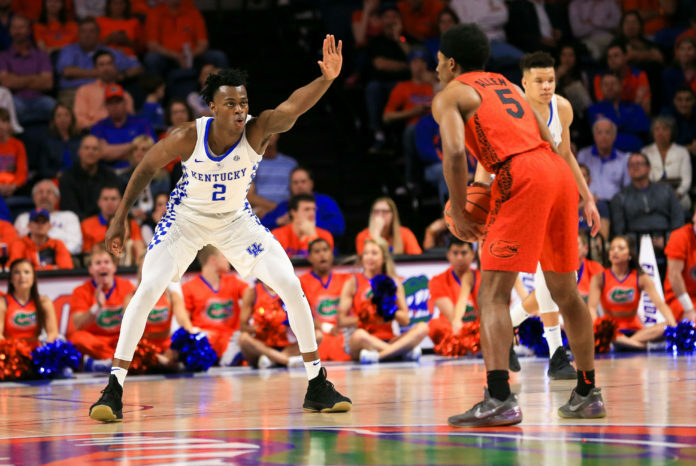 Being able to get a body on the guard when rolling out of the dribble handoff creates tons of room for Shai-Gilgeous Alexander, his point guard. Once Missouri realizes that Gilgeous-Alexander is suddenly open after the screen, they panic and both leave Vanderbilt, who gets the easy dunk after being left wide open. Being that the dribble handoff is such an important staple of the Nuggets offense, it is great to see that Vanderbilt is able to produce in that setting, as he does once again below. Vanderbilt can produce in the dribble handoff, as an off-ball cutter, or as a simple rim roller when he isn’t handling the ball like a point guard. His offensive skill set is diverse, but it is lacking one big piece — shooting. Vanderbilt’s offensive ceiling would be astronomically higher if he just was able to add any kind of shot outside of dunking or laying it up. Unfortunately, Vanderbilt has not shot well at all over his basketball career. Between the FIBA U-16, Adidas Nations, Nike Global Challenge, Nike Hoop Summit, McDonalds All-American game, Jordan Classic, and Nike THE TRIP, Vanderbilt shot just 47 percent from the field (114-243) and just 18.7 percent from three-point distance (3-16). He really has no shot creation outside of getting to the rim or having a teammate set him up with a dunk or an easy layup. To make things worse, Vanderbilt has not shown any aptitude with a mid-range game either. He lacks a consistent floater, push shot, or a pull-up jumper. To get the most out of his playmaking ability, Vanderbilt has to find a way to get some jump shots to fall, but that seems to be a long ways off still. But, if Vanderbilt can add a jumper, he has the rest of the offensive and defensive skills necessary to be a two-way terror in the NBA for years to come. The development of his shot will be the precursor to his ascension in the NBA. The other ‘what-if’ that pertains to Vanderbilt pops up when discussing his injury history. After three left foot surgeries between high school and college, Vanderbilt looked like a less explosive athlete in his 14 games with Kentucky last season which hurts his long-term projection. Look at the kind of explosion Vanderbilt was getting back during high school before three foot injuries sapped some of his athletic talents. Now, look at the lack of explosion from his return to Kentucky. In the clip below, Vanderbilt is able to coil and load up before jumping, and still wasn’t able to pop off of the court like he once could. Sure, the explosion could return as he continues to improve his body and gets healthier, but the difference at least needs to be noted. Vanderbilt was always a fluid, but not elite athlete. If the foot injuries he has sustained have depleted some of his athletic gifts, that would limit his potential ceiling. Still, that is not to say that he can’t get up when he needs to. Vanderbilt’s spectrum of outcomes is as wide and volatile as any player drafted in 2018. On one hand, he could never fully recover from the three left foot surgeries that he had to have and his athletic gifts could suddenly dissipate. If that happens, and he never develops a jump shot, he will be a helpful defender and tertiary playmaker at best. 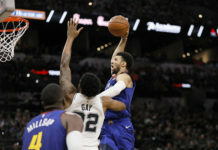 If his foot injuries are a thing of the past and he is able to become even a passable jump shooter, suddenly Vanderbilt would look like a potential All-Star and one of the better role players in the entire NBA with his offensive playmaking skills paired with his above average defense and tenacious style of play. Vanderbilt has the potential to be the long-term starting power forward of the Nuggets if things break right for him. Time will tell how good Vanderbilt can be, but the level of excitement surrounding him from the Nuggets coaching staff and front office should speak volumes.